Before the meeting, Larry Woodman (N0XGL) of Belleville gave a speech and demonstration of an antenna he built. The meeting was called to order by Presiden Chuck Moore (N0MXI) at 11:05 am with 17 members and guest present. 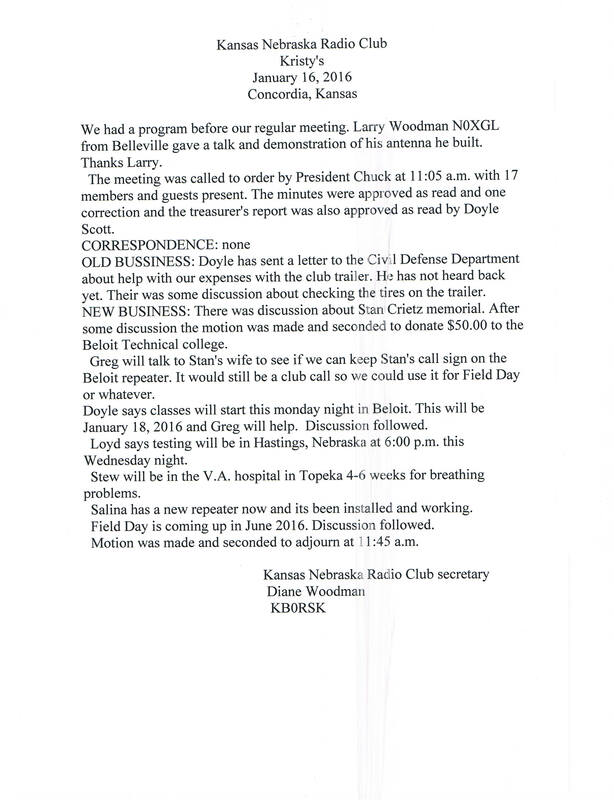 The minutes were approved after one correction, and the treasurer’s report was read by Doyle Scott (WB0SRP) and approved by the membership. Doyle has sent a letter to the Civil Defense department requesting the annual expense check for the club’s EMCOMM trailer. No reply has been received. There was some discussion about checking the tires on the trailer. There was discussion about the Stan Creitz memorial. After some discussion the motion was passed to donate $50.00 to the Beloit technical college. Greg Geyer (N0LLH) will talk to Stan’s wife to see if we can keep Stan’s call sign on the Beloit repeater. It would still be a club call so we could use it for field day or whatever. Doyle reports that classes will start this Monday night, January 18, in Beloit. Greg will also be co-teaching the class. Discussion followed. Lloyd Swihart (AD0OF) reports that there is a testing session in Hastings at 6:00 pm this Wednesday night. Stew (KE0AYD) will be in the VA hospital in Topeka for four to six weeks for breathing problems. A new Yaesu System Fusion repeater is on the air in Salina. It replaces an existing repeater. The frequency is 444.875, PL tone 118.8. It is a digital and analog repeater. There was discussion about Field Day coming up in June. The meeting was adjourned at 11:45 am. Edited and transcribed to WordPress by Justin Reed NV8Q.